There is something really wonderful about a simple dish. There is an elegance about them that you can't beat. It is its own art. Doing it well is trickier than it may seem. But when you get a simple dish down it ends up being a cornerstone of your recipe repertoire. Poached salmon is just such a recipe. It is simple, tasty and is the foundation for any number of menus or other dishes you might devise. The challenge with a poached salmon is making sure it does not taste "fishy" or overdone. Ideally you want to buy the fish fresh the day you are going to poach it. Having it a little fattier is also good. The farm raised salmon rather than wild Coho works best. 1. Rinse salmon and pull out any random bones with pliers. 2. Place salmon in a skillet with a cover. 4. Bring water to a boil and boil for one minute. Then turn off heat and let the fish cook in the hot water for another 7 - 10 minutes, depending on the thickness of the cut. When done the fish should flake with a fork and be a reddish pink. Remove from the hot water as soon as it flakes so it does not continue cooking. 5. Serve hot or cold. 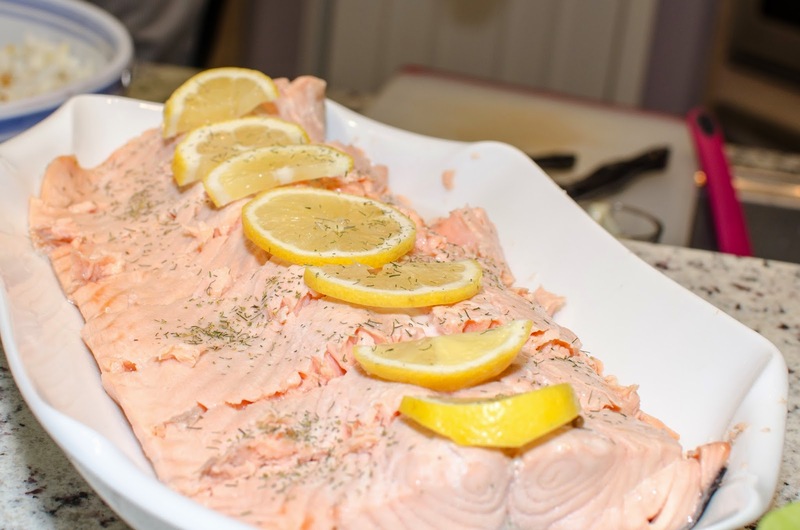 The poached salmon is also good to use in any any variety of recipes that call for a cooked meat or fish like salads, pasta, sandwiches, omelets or soups. You are only limited by your imagination. **To be completely true to the Whole30 program substitute the sake for rice wine vinegar.